Last week, I went to the UK's largest ever exhibition of very influential fashion photographer Guy Bourdin featuring over 100 of his provocative and bold photographs, sketches, notes and unseen images. If you are into Fashion and Photography, keep scrolling down so you can get a feel what to expect if you are planning a visit! There is a little shop where you can buy his photographs, posters, books or general Make up, Fashion and Photography books. 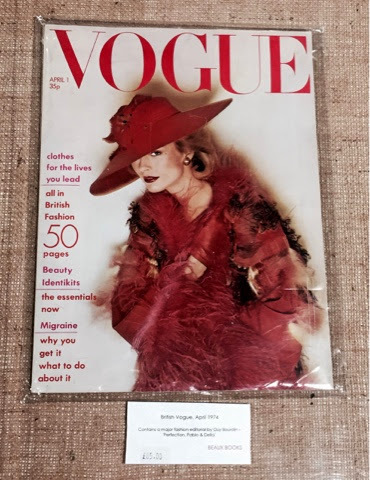 Naturally, his photographs regularly made it to different magazine covers, this one if of Vogue from 1974! You can get your ticket here. The exhibition runs daily until 15th March 2015, so if you are a Londoner, make sure you visit and share your experience. THANK YOU for introducing me to Guy Bourdin. I've never heard of him before, but his images are stunning and completely my style. Off to do more research about him, so happy I found your blog! Glad to hear from a happy reader :) You would definitely enjoy the exhibiton, so inspiring. Amazing pictures, it looks like a wonderful exhibition! I love your blog and I have followed you with Bloglovin. If you ever get a chance to check out my blog I would be delighted, thanks! These images are amazing! Thank you for sharing them! First time to hear about this photographer, but his works are just wow. Besides, the image or Clipping Paths photograph editing administrations offered by expert organizations help an awesome arrangement in upgrading the general pictures. All are looking amazing . You have a great thanks for this post . Amazing photographs.Thank you very much for sharing. Amazing image. i love your photographs.Well post you published here with us . I appreciate it .